Media Cope is a multi-functional software which can easily play, cut, convert and join any audio, video in any format like mp3, aac, wma, flac, rmvb, mp4, 3gp, wmv, mov, avi, divx, mpg, flv, mkv, vob, dat etc. It can cut, convert any of your pics. It includes the fastest photo cutter which can convert 100s of your pics in minutes. It can also be used to view slide show of your photos with video effects in real time. Basically it is all you need. ...... to the format of your choice. Audio Converter - It can convert almost any audio/video to any audio format. 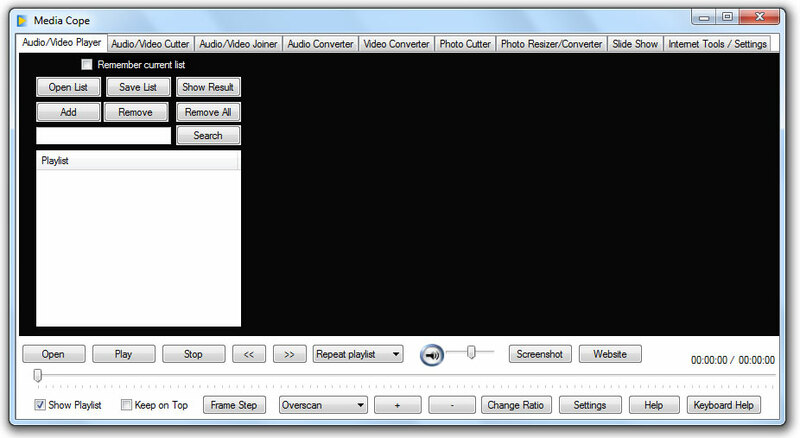 Video Converter - It can convert almost any video to any video format. You can also crop/pad videos using this. Photo Cutter - This can convert 100s of your photographs in few minutes. It can save a lot of time when you need to crop a lot of photographs. Qweas is providing links to Media Cope 3.2 as a courtesy, and makes no representations regarding Media Cope or any other applications or any information related thereto. Any questions, complaints or claims regarding this application Media Cope 3.2 must be directed to the appropriate software vendor. You may click the publisher link of Media Cope on the top of this page to get more details about the vendor.